No'ar Hadash is Hebrew for "new youth" and is the Reconstructionist programming network. It promotes and fosters creative, innovative, and fun Jewish youth programming from a uniquely Reconstructionist perspective. Camp Havaya is a Reconstructionist overnight summer camp where many of our BAS youth spend their summers. 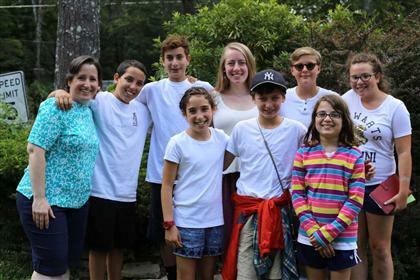 The Foundation for Jewish Camp commissioned a study on the power of Jewish summer camp. They found what campers and their parents have known for years: camp works. More than nearly any other experience, summers at overnight Jewish camp instill in our youth a deep commitment to the Jewish community. Kids who go to camp are much more likely than their non-camp friends to be actively engaged in the Jewish community as adults. The research proves that the magic of camp is real and long lasting! Providing opportunities for kids to live out the values inherent in Reconstructionist communities, Camp Havaya offers innovative, creative, and engaging programs for youth entering second through twelfth grades. The only Reconstructionist camp in the world, Camp Havaya is a joyful and welcoming Jewish youth community that transforms lives. As an inclusive community, we welcome children from a wide variety of family structures, religious practices, and socio-economic backgrounds. At the center of all we do is a deep commitment to building a community in which all are welcome to grow and thrive. Recognized as one of the “Top 10 Jewish Camps,” we have all you would expect from the best camps: swimming, soccer, boating, tennis, volleyball, visual arts, hiking, camping, music, drama, a spectacular challenge course, and so much more. In addition, we place a strong emphasis on experiential learning, creative prayer, and meaningful spiritual experiences. All of these pieces combine to create a holistic camp environment for the holistic camper – providing varied opportunities for exploration and growth in a uniquely Reconstructionist setting. We offer one, two, three, and four week sessions, plus a five day Family Camp program, all on our beautiful 120-acre wooded property in the Pocono Mountains of Pennsylvania. In a commitment to making camp accessible to all, generous scholarships and travel subsidies are available. A camper parent said that Camp Havaya’s greatest strength is “creating, fostering, emphasizing a sense of Jewish community … instilling values of respect, kindness and social responsibility … helping our children to look at the world through a lens of cooperation, community and acceptance.” Camp Havaya is truly a joyful and welcoming Jewish youth community that transforms lives. Let your child be one of the many children whose life is transformed this summer! For more information about Camp Havaya watch our video and please visit camphavaya.org or call 877-226-7573. And check out www.onehappycamper.org to learn about how eligible first time campers can receive up to $1,000 off Jewish summer camp.